15th - 16th November, White-wingers! Winter is well underway with temperatures dropping and a cold wind sweeping over the island. A strong breeze has made birding tough but the sheltered bays on the east side of the island have offered a great opportunity to find concentrated flocks of waders and gulls. Highlights for the 15th include 4 Red-throated Divers, Great Northern Diver, 2 Red-breasted Merganser and 2 Black Guillemots. Waterfowl numbers remain high with 163 Wigeon, 33 Teal, Green-winged Teal, 13 Shoveler, 4 Tufted Duck, 101 Eider and 23 Long-tailed Ducks in the southern portion of the island. Birds of prey are also about with the Northern Harrier, Hen Harrier and Merlin all still lingering. Nouster Bay alone had much to offer with the strandline attracting a huge number of birds including 100's Starlings, the majority of the 678 Sanderling currently inhabiting the east coast, 122 Common Gulls, 14 Herring Gulls, 43 Great Black-backed Gulls and best of all a smart juvenile Iceland Gull! Remaining passerines include 7 Blackbirds, 11 Fieldfares, 8 Redwings and 10 Snow Buntings frequenting the coast at Bride's Loch. It was also a surprise to see the Glossy Ibis drop in at Bride's Loch to have a wash. The 16th November brought with it our second white-winger in two days, this time a stunning juvenile Glaucous Gull which flew west past Trinley, later resurfacing in Nouster. 203 Wigeon, 29 Teal, 13 Mallard and a Whooper Swan represent the waterfowl highlights whilst noteworthy high counts come from the Nouster and Bride's area include 55 Lapwing, 90 Purple Sandpipers, 23 Curlew and 2 Red-breasted Mergansers. Finally, 13 Blackbirds, 12 Fieldfares, 8 Redwings, 6 Snow Buntings and 2 Robins cover the selection of passerines. An exciting day driving around in the Land Rover conducting the whole island Greylag count. We counted a grand total of 805 Greylags in a two hour period! En route we also encountered 10 Pink-footed Geese, 2 Whooper Swans and a selection of ducks including 30 Teal, 24 Mallard and 6 Tufted Ducks. A look around some of the sheltered bays produced 3 Red-breasted Merganser, 9 Red-throated Divers and 2 Long-tailed Ducks. Wader numbers were on the up thanks to a wider coverage and included 117 Golden Plover, Grey Plover, 43 Lapwing, 20 Purple Sandpipers, 66 Snipe, 3 Bar-tailed Godwits, 24 Curlew, 45 Redshank a late Black-tailed Godwit and an impressive flock of 156 Sanderling in Nouster. The Northern Harrier, Hen Harrier and 2 Peregrines were also seen. Other totals higher than the last couple days included 32 Rock Dove, 29 Moorhen, 8 Twite and 16 Snow Buntings. To add to the diverse mix were 13 Blackbirds, 22 Fieldfare, 10 Redwing, Chiffchaff and 2 Skylark. The Glossy Ibis seems to be content lingering on the island and can still be found on the heaps of decaying seaweed below Hooking. Today's totals also reflected a good effort invested in the field. Best of all were the discovery of 2 redhead Smew on Bewan, perhaps last winters returning birds which represent the fourth and fifth island records! 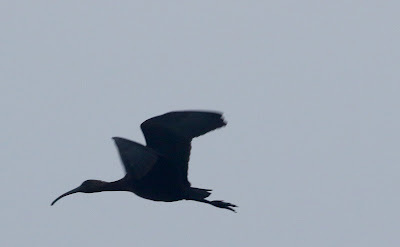 Also new in was an adult Pale-bellied Brent Goose which flew west past the pier and a Short-eared Owl quartering the Lurand crop field. Other species of note were Red-throated Diver, 2 Great Northern Divers and a nice selection of waterfowl about the island including 32 Teal, 100 Wigeon, 13 Mallard, 2 Pintail, 3 Long-tailed Duck, Goldeneye, 5 Tufted Duck, 7 Shoveler and the drake Green-winged Teal on Gretchen. There were also 9 Twite at the North End of the lighthouse. More effort was invested in the field on the 12th, however, a calm period in the otherwise windy weather allowed nets to be opened at Holland gardens with the attempt of trapping a couple migrants leaving their roost. Unfortunately the nets remained empty despite seeing 2 Woodcock, 7 Fieldfare, 2 Redwing and 5 Blackbirds around the gardens. A Waxwing also flew over the obs later that day. We went a little further afield on the 12th. Birds seen included 5 Red-throated Divers, Great Northern Diver, 4 Red-breasted Mergansers. With impeding bad weather gulls often come ashore to shelter from strong wind and rain. Given that 15 Common Gulls, 30 Herring Gulls and 60 Great Black-backed Gulls had arrived on the Links it was clear that tough weather conditions were setting in heralding the arrival of winter. A little more winter spirit came in the form of 5 Snow Buntings. Waterfowl numbers remain consistent with 71 Wigeon, 12 Teal, 2 Pintail, 4 Shoveler, 12 Long-tailed Duck and the lingering Green-winged Teal. Waders on offer included 85 Sanderling, 2 Grey Plover, 3 Purple Sandpipers, 25 Dunlin, 12 Bar-tailed Godwit. A few lingering winter migrants around Holland and the obs added 10 Blackbirds, 17 Fieldfare, 18 Redwing and a Long-eared Owl to the totals. In all, a satisfying end to the day. The 9th was mostly spent focusing on data entry and other obs tasks so it wasn't until the 10th that some more birding got done. However, it was a great day with a single hours seawatch producing a juvenile Pomarine Skua, 14 Long-tailed Ducks, 9 Red-throated Divers, 8 Great Northern Divers and a steady passage of 519 Fulmars in a single hours count. Commoner seabirds seen in the mornings passage included 214 Gannets and 130 Kittiwakes as well as a trickle of 33 auks and 2 Black Guillemots. Elsewhere around the island, 3 Whooper Swans, 8 Shoveler and 10 Tufted Ducks lingered whilst raptors were well represented by the male Northern Harrier, a ringtail Hen Harrier, Merlin and a pair of Peregrines. A brief excursion into Holland gardens was particularly exciting as a Long-eared Owl was found roosting in the top of the fuchsia bushes. Two Woodcock also burst out of cover and a distinctive "trill" soon alerted the presence of a Waxwing sitting in the middle net ride. Other noteworthy passerines such as the 12 Blackbirds, 17 Fieldfare, 23 Redwings and 4 Robins hinted that a small arrival of birds had occurred in the last 24 hours following a slight lull in the wind. Other migrants on offer were 2 Blackcaps, 2 Chiffchaffs, 2 Chaffinches, 12 Twite and 3 Snow Buntings. Continued effort in the field has proved worthwhile although a reduced obs staff has meant that the island is covered less thoroughly but still opens up the opportunity for finding some brilliant birding highlights. We said goodbye to George and Erin, two incredible friends who have dedicated a huge amount of their time and effort into the upkeep of the obs, offered great support by taking charge of the ringing as well as their time spent out in the field doing census. Thanks for an amazing time! A short seawatch on the 7th brought with it yet more of the previous weeks variety, including 43 Sooty Shearwaters, 5 Manx Shearwaters, 5 Red-throated Divers, 7 Great Northern Divers, 16 Long-tailed Ducks, 4 Little Auks, 16 Puffins, 3 Black Guillemots, 3 Red-breasted Mergansers, and a Great Skua. A timed count of Kittiwakes and Fulmars for fifteen minutes produced 115 and 242 birds respectively. The later species included 8 "blue" morphs in the full two and a half hour watch. Noteworthy waterfowl distributed around the island included 5 Whooper Swans, 42 Wigeon, 8 Gadwall, 9 Teal, 3 Pintail, 15 Shoveler and 3 Goldeneye. 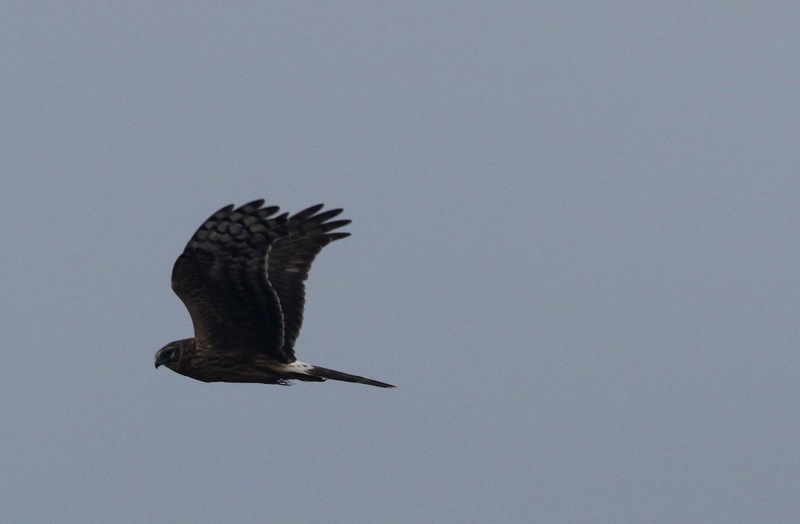 Three species of birds of prey were encountered in a brief excursion, Northern Harrier, Hen Harrier and Merlin. 7 Purple Sandpipers and 20 Sanderling were around Nouster, the later is always worth checking for colour ringed birds, mostly originating from Sanday. However the proportion of ringed to unringed birds have diminished a great deal recently suggesting that there is still a steady turnover of new waders arriving and leaving the island. Some hardy passerines are still lingering, a flock of 6 Snow Buntings being the highlight amongst a commoner selection of 5 Robins, 2 Chaffinches, 15 Blackbirds and 5 Redwing. It's amazing what a day of difference does to the birding scene. A one and a half hour seawatch produced only 3 Sooty Shearwaters, 5 Red-throated Divers and 3 Great Northern Divers. In contrast, auk numbers had increased dramatically with 1411 passing in a single hour, aided by the light southerly breeze encouraging a surge of birds out of the North Sea. 2 Black Guillemots, Red-breasted Merganser and 2 Long-tailed Ducks were also seen. Waterfowl numbers were not quite as evident as the day before but Teal and Mallard counts rose to 32 and 19 respectively whilst 3 Whooper Swans lingered. Other birds of note included the male Northern Harrier, Merlin, Woodcock, 7 Bar-tailed Godwits. 23 Blackbirds, 6 Redwing and a Chiffchaff were all that could be found on the passerines front. Varying amounts of effort in the field has been hampered by strong winds and prioritizing more ringing data entry into IPMR. Nevertheless, some time spent outdoors on the 5th produced a good selection of raptors including 2 immature Peregrines (male and female) touring Tor Ness and engaging in some spectacular wheeling displays. A Merlin was also seen as was the lingering star, the stunning adult male Northern Harrier, reliably appearing around the vicinity of the observatory around breakfast time. Other species of note from the 5th include Whooper Swan, Snow Bunting and Woodcock. Once again seawatching took priority on the 6th, with a great reward in the form of a close fly-past adult winter White-billed Diver heading north past the hide shortly after 9am! This elated our spirits greatly and proves just how productive November can be despite the majority of autumn migrants having departed. Further birds of note included 3 Red-throated Divers, 1 Great Northern Diver, 1208 Fulmars in one hour, 27 Sooty Shearwaters and 3 Long-tailed Ducks. Yet more seabird passage included 86 Gannets in one hour, 50 Kittiwakes, 15 Guillemots, 2 Black Guillemots, 3 Little Auks and 36 auk sp. all proving just how resilient, diverse and productive marine life can be despite the bleak and inhospitable appearance of the seascape. A young Gannet was also discovered sat on the field adjacent to the seawatch hide. It appeared to be in good health and offered a valuable opportunity to watch it close up as well as ring it. Seabird passage is stealing the limelight with staggering numbers of birds still on the move. A total of four hours were invested at the seawatch hide watching thousands of birds pouring out of the North Sea and into the Irish Sea on the 3rd November. Fulmars featured strongly with 3390 passing in a single hour (34 "blue" morphs in the full four hour watch)! 114 Sooty Shearwaters flew north along with 4 Manx Shearwaters shadowed by a steady trickle of 6 Great Skuas and 11 Pomarine Skuas (predominantly immature birds in stark contrast to fully spooned adults and sub-adults that passed through on the 29th -30th October). A nice variety of commoner seabirds were also on the move, including 4 Red-throated Divers, 3 Great Northern Divers, 2 Red-breasted Mergansers, 213 Gannets, 13 Long-tailed Ducks, 251 Kittiwakes and a selection of wildfowl including a female type Goldeneye amongst a small turnover of Mallard, Teal and Wigeon. We are fortunate enough to have five species of auk on a regular basis at this time of year. 13 Little Auks, 6 Puffins, 3 Black Guillemots, 32 Guillemots, Razorbill and 212 auk sp. were todays reward. Another incredible moment was watching a breaching whale far to the NW of the northern tip of the island. Although it was seen breaching on nine occasions it was simply too far away to identify. Besides seawatching a some perambulations around the island produced the lingering Hen Harrier and 2 Whooper Swans. The 4th November was a little less busy but there was still a decent selection of seabirds including 2 Red-throated Divers, 2 Great Northern Divers, 16 Long-tailed Ducks and 376 Fulmars in 15 mins (including 2 "blue" morphs). Shearwater numbers have subsided somewhat with only 8 Sooty Shearwaters and a single Manx Shearwater passing in the full two hour count. Nevertheless to have any shearwaters in November is noteworthy in itself so to speak of a passage with triple figures featuring until the 3rd is unprecedented! Furthermore, seawatching also yielded 1 Pomarine Skua, 6 Great Skuas, 1 Red-breasted Merganser, 7 Little Auks and 2 Black Guillemots. Some other scattered sightings amounted during the day include 174 Wigeon, 40 Mallard, 42 Teal and Green-winged Teal on Gretchen as well as Merlin and 14 Purple Sandpipers. The birding scene has quietened down a little with a greater focus now invested on inputting much of our ringing data that has amounted during the year. A cursory overview of the data suggests we have experienced yet another rewarding and productive year with some incredible highlights. However, there are still plenty of exciting birds to be found without having to reflect on the stars of this year. A quick visit to Gretchen was all that could be achieved, thanks to the aforementioned data entry consuming most of our time. The lingering drake Green-winged Teal offered a welcome break. The 2nd November involved a little more effort in the field again. Seawatching yielded 113 Sooty Shearwaters, 1 Manx Shearwater, 6 Little Auks, 6 Black Guillemots, 127 auk sp., 5 Red-throated Divers, 2 Great Northern Divers, 262 Fulmars, 131 Kittiwakes, 104 Gannets, 6 Long-tailed Ducks and a Red-breasted Merganser. The stunning adult male Northern Harrier continues to grace the island with a ringtail Hen Harrier. Other noteworthy non-passerines include Grey Plover and 2 Whooper Swans. On the other hand, passerines can still be found in small numbers, including 4 Robins, 2 Blackcaps, 5 Chiffchaffs, 32 Twite, 21 Snow Buntings, 17 Blackbirds, 41 Redwing and a single Fieldfare. 31st October - More migrants! Other non-passerine highlights include the ringtail Hen Harrier, a single Merlin, 2 Woodpigeon and the Hoopoe. A good diversity and number of waders are also still to be found with totals including 541 Golden Plover, 1 Grey Plover, 58 Oystercatchers, 53 Ringed Plover, 122 Lapwing, 47 Sanderling, 63 Purple Sandpipers, 25 Dunlin, 79 Snipe, 3 Woodcock, 22 Bar-tailed Godwits, 49 Curlew, 134 Redshank and 189 Turnstone, most of which are gaging themselves on invertebrates found amongst the huge banks of decaying seaweed deposited on the east coast. Last but not least the passerines. Late autumn passage tends to be dominated by the thrushes with a mixture of lingering birds and the occasional new arrival. Their totals include 45 Blackbirds, 20 Fieldfare, 143 Redwing. The majority of other passerines are now centered around our main ringing site at Holland gardens and around the observatory, the main exception being 18 Meadow Pipits, 1 Rock Pipits and a flock of 32 Twite at the northern end of the island. The rest being 5 Robins, 5 Blackcaps, 7 Chiffchaffs, 1 Goldcrest, 2 Chaffinch, 2 Brambling and 3 Lesser Redpoll. The only non-avian highlight of the day was a single Silver Y, a reminder that migrant birds aren't the only animals to be arriving here. 29th-30th October - Costa del North Ronaldsay? It's been a very good couple of days on the Costa del North Ronaldsay, you might wonder why we're calling that?! You'll have to read on to find out! I'll start with ducks and other wildfowl 108 Whooper Swans on the 29th grew to 141 on the 30th, there were 8 Bean Geese on the 30th, an astonishing 405 Wigeon on the 29th were supported by 12 Gadwall, 87 Teal, 60 Mallard, 5 Pintail, 38 Shoveler, 31 Tufted Duck, the same female Scaup, 21 Long-tailed Duck, 11 Red-breasted Mergansers, 1 Goldeneye and the long staying Green-winged Teal. A couple of days of good sea-watching provided some large numbers and a massive surprise for Gary and Sam! Over the two days 28 Pomeraine Skua, 4 Manx Shearwater, 869 Kittiwake, 228 Sooty Shearweaters, 6248 Fulmars including a couple of blues and that big surprise was a second Fea's Petrel of the year off Dennishead, the bird showed very well for both the guys and prompted a very excited response from Sam! Good numbers of Red-throated and Great-Northern Divers were present with 12 and 16 respectivly. Our Waders are still begining to build up with 5 Golden Plover, 54 Purple Sandpipers, 87 Dunlin, 261 Snipe and 3 Woodcock. Other birds of intrest include a very pale Yellow Wagtail seen breifly at Brides, 5 Waxwing were at Holand on the morning of the 30th, 12 Robin, 4 Blackcap, 1 Goldfinch, 7 Chiffchaff, 1 Mistle Thrush, 56 Twite and 30 Snow Bunting. The big surprise came in the shape of another Southern speciality! 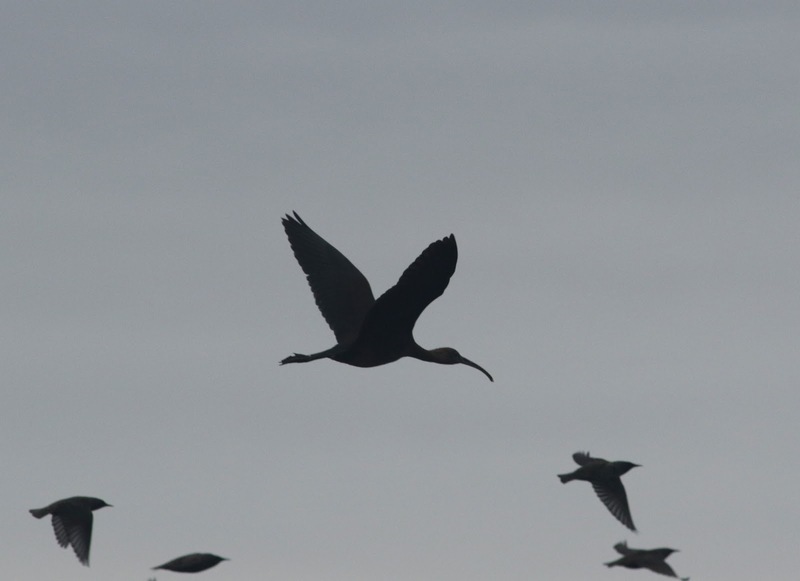 Our 3rd record of Glossy Ibis was found at Hooking Loch before relocating to the beach. 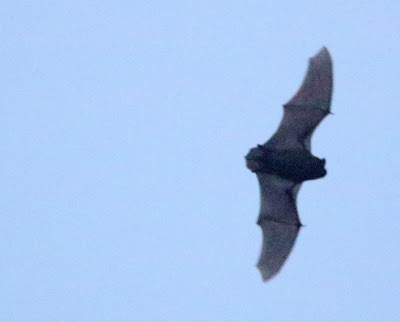 Another suprise was a for now un-identified Bat species, if anyone can give us some pointers that'd be great! So that's why we're calling it Costa del North Ronaladsay.